Catching up on some hockey news over the past several days, but the 2016 World Cup of Hockey is officially in the books with a win by Canada. Sidney Crosby took MVP honors after Canada posted two victories over Team Europe coming from behind in the second game to get a late winner from none other than Brad Marchand. Patrice Bergeron also scored in the decisive contest, as he has done throughout the tournament. Bergeron and Marchand were dynamic throughout the tourney, and what is nice about their performance is that it opened up the eyes of other fans around the league to what the duo means to the Boston Bruins. The B’s just showed Marchand the love on his new eight-year extension announced this week, and he took a discount to stay in Boston. I’ve been told by several sources who know him that remaining with the team was not really in doubt, as being close to his family in Nova Scotia was important to him, not to mention the fact that he had grown up a Bruin ever since the team moved up in the third round to take him in 2006. That was an important draft year for the Bruins, as the team ended up with Phil Kessel, Milan Lucic and Marchand (not to mention Tuukka Rask, who was acquired via trade during the proceedings). Only Marchand and Rask remain, but 2006 was a critical year for Boston, ultimately leading to the Stanley Cup championship in 2011. With the WCOH now in the rearview mirror, Bergeron and Marchand can return to the B’s and put their focus on where it belongs: on preparing to play the 2016-17 NHL season. It appears they made it out of the tournament relatively unscathed (knock on wood) and it’s one more championship they can add to their respective trophy cases. For the rest of the NHL, the two served notice that they belong in the conversation with the league’s constellation of stars, but for Bruins fans- it’s time to get down to brass tacks. Veteran defenseman Dennis Seidenberg has landed with his old defense partner on Long Island (well, Brooklyn, actually), joining Johnny Boychuk and the New York Islanders on a one-year deal after the B’s bought him out this summer. He’s a good guy who in the right role can be a serviceable player on the ice, while a solid teammate and addition in the room. After being acquired from the Florida Panthers in 2010, Seidenberg was one of Boston’s most trusted and reliable defenders, but after signing a four-year extension in late 2013, suffered a catastrophic knee injury and was never the same afterwards. Some have argued over the wisdom of buying him out, but as long as he was here with two more years remaining on that deal, he would have gotten playing time and likely prevented other younger defenders from working their way into the rotation. While he was game and willing to do whatever it takes, his body limited him, and the B’s made the tough decision to move on. He’s someone who can help the right team as long as he isn’t being asked to do too much, which was the case in Boston last year and in 2014-15. The Stanley Cup-era Seidenberg is long gone, but the 2016 version will likely be a solid if lower-end contributor to the Isles’ fortunes this season. Los Angeles Kings goaltender and pride of Hamden, Connecticut- Jonathan Quick- sported a tribute to the U.S. Army Special Forces on his WCOH mask. The Team USA performance was certainly disappointing, but the mask art, painted by Steve Nash of EyeCandy Air, is definitely not. My dad served in the Special Forces in the 1970’s and 80’s- before it became an official branch of the U.S. Army, so I guess you could say he was an “old school snake-eater”, but since 9/11- the Global War on Terror has taken a toll on the U.S. military’s special operations forces in particular- they’re still very much in the fight all over the world, but we very rarely hear about the dangerous missions and arduous work they do because of the secret nature of said efforts. Quick’s mask takes a “less is more” approach, with the crossed arrow branch insignia and “De Oppresso Liber” motto, along with the dagger-through-skull that is a popular tattoo among many in the detachments. The mask is being auctioned over at the NHL auction site to benefit the Special Forces Charitable Trust, and the current bid is over $10k…well done, Mr. Quick! And speaking of the U.S. Army, I picked up Amber Smith’s book “Danger Close- My Epic Journey As A Combat Helicopter Pilot in Iraq and Afghanistan”, and it’s a good read. What struck me about it is what a small world we live in, though. As the brigade battle captain, I recall the new unit coming into our airspace on missions and on occasion, hearing the female voice of one of the pilots, whose call sign was ‘Annihilator 24’- she was always all business and that unit- the 2nd Squadron, 17th Cavalry Regiment, was always there to support our guys on the ground. But those of us in the brigade’s tactical operations center always wondered who Annihilator 24 was. Well, after picking up the book, I finally have my answer after 11 years- it was Chief Warrant Officer 2 Amber Smith. She’s written an interesting book about the life of a female combat aviator flying in a fragile, Vietnam-era airframe (the Army retired the OH-58D from active service several years ago), where Kiowa drivers frequently exposed themselves to lethal ground fire in order to deliver .50 caliber and rocket fire to enemy insurgents when our troops were in contact. I want to thank Ms. Smith (that’s how we address warrant officers in the Army- that and by calling them “Chief”) for her service and support to my unit. She knew me as “Hammer X-Ray” when she would check in and out of our AO- our relationship was purely professional and we wouldn’t know each other if we bumped into each other on the street, but it feels like we’ve been friends for years. Pick up her book- she’s got quite an interesting story to tell. For those who remember, Patrick O’Sullivan was a polarizing figure in the early 2000s as a highly talented, dynamic scoring forward who had been the first overall selection of Don Cherry’s Mississauga (now Niagara) IceDogs in the 2001 OHL draft, but for whom a black cloud seemed to follow. O’Sullivan dazzled with his pure offensive ability, emerging as a top scorer as a rookie during the 2001-02 season amidst a renaissance of top future NHLers including Corey Perry, Eric Staal, Nathan Horton and Brent Burns to name a few. But criticisms dogged him along the way- scouts questioned his attitude…the desire…and later, a darker picture emerged about his father, John, and the unhealthy relationship he appeared to have with his son. That story emerged more prominently before the 2003 NHL Entry Draft in a comprehensive ESPN the Magazine piece penned by Gare Joyce, which revealed a long pattern of abuse and the split between the younger O’Sullivan and the man driven to see him reach the NHL no matter the cost. 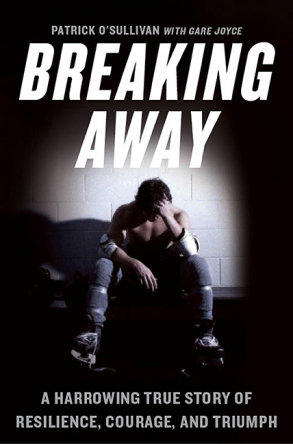 Now, years after finishing a pro hockey career that leaves us wondering what might have been (334 NHL games, 161 points with Los Angeles, Edmonton, Carolina, Minnesota and Phoenix), O’Sullivan and Joyce have authored a definitive account of his journey and the demons he battled along the way. Born to a fringe minor league (and by fringe- we’re talking the lowest rung of the professional hockey ladder) forward who was the son of Irish immigrants, when Patrick O’Sullivan began to show early signs as a prodigy in the sport, his father began a single-minded and destructive pursuit in pushing his only son to a greatness he himself had not been capable of. O’Sullivan tells the disturbing story of physical and emotional tyranny, not just perpetrated by John O’Sullivan but by his mother, who stood powerlessly by and never took any meaningful action to defend her child from his father’s excesses. As a result, young O’Sullivan became a hockey nomad, moving from team to team. At first his father was involved as a coach, but he would soon wear out his welcome due to his bizarre antics that usually included focusing all of his attention (and ire) on his son while ignoring the rest of the players. One of O’Sullivan’s earliest minor coaches was former NHL player and Boston Bruins forward Dwight Foster, who now admits that if he had more experience as a coach, he would have done more to confront the elder O’Sullivan and seek help for his son. Thus continues an ongoing pattern in the book, as O’Sullivan went from team to team, with more and more people picking up on the warning signs that all was not well as his father’s erratic behavior increased in its scope and intensity. When not striking him, O’Sullivan alleges that his father would kick him out of the family van after games in the dead of winter and make him run a mile a more before he was allowed back into the vehicle. This all came to a head one night after an OHL game, when O’Sullivan stood up to his father and received a savage beating on the front lawn of his grandparents’ (on his father’s side) lawn. This prompted the player’s call to police that ultimately resulted in formal assault charges and a jail sentence for John O’Sullivan, though many would argue that the amount of time served was essentially a slap on the wrist. By the time the 2003 NHL draft occurred, O’Sullivan had formally severed ties with his father, but what should have been one of his happiest days was miserable. The 14th-ranked skater by the NHL’s Central Scouting Service plummeted to 56th overall and O’Sullivan leaves little doubt it had a great deal to do with teams preferring to distance themselves from the potential baggage O’Sullivan brought to the table. Although he reached the NHL, and at one time despite having a coach in Marc Crawford or “Crow” as O’Sullivan refers to him in the book, a man that reminded him more of his father than anyone else, showed promise with a 21-goal, 53-point sophomore season in 2007-08. Unfortunately, the team traded him to Edmonton, where a role on the third line saw his performance slip, and he was ultimately out of the NHL and hockey altogether by 2012. Although his ordeal resulted in no meaningful relationship with either of his parents- O’Sullivan and his mother no longer speak after he alleges she broke off contact when he would no longer funnel money to her- the optimism in the book springs from the bond he has with wife, Sophie, and his two sons. The book is difficult to get through in parts, particularly for those who have children and will have a tough time understanding the cruelty with which O’Sullivan was treated in what appears to be a misguided and extreme case of living vicariously through his impressive natural talent. The book’s coda is almost heartbreaking in itself, as O’Sullivan relates what how his life experiences have impacted the way he views the world as his own boys grow up and prepare to compete in youth sports programs in their native Florida. This is an important book at a time when professional sports are becoming more lucrative for the athletes than ever, and more and more parents are faced with the temptations that come with having children that could represent a significant meal ticket, despite the long, long odds to get there. It also outlines a specific group of people who had the power to stop what was happening but were unable to either because of a lack of information or because they simply chose to look the other way. In essence, that is what makes for some of the toughest reading to get through, as the betrayal of a young boy and his loss of innocence is not simply confined to those who directly perpetuated the abuse. Thank Patrick. Suffering over the keyboard in my role looks awfully small beside what he had to endure and survive. Whether you are an avid hockey fan or parent raising a youngster involved with hockey or competitive sports in general, read the book, understand the warning signs and be prepared to take action. Patrick O’Sullivan’s courage to come forward and tell his story should not be in vain.